Beyond road and track motorcycle racing, there is a variety of extreme motorbike sports practiced in the UK and around the world. Throughout the UK, local clubs organise a wide array of events and competitions for these exciting sports. Major extreme motorbike events include the Scottish Six Days Trial and the British Motocross Championship. 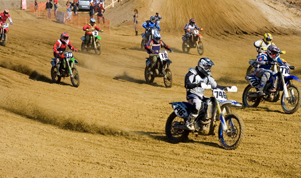 Motocross is the equivalent of road racing but on off-road circuits. Organised on a closed circuits, non-tarmac surfaces are used such as grass, sand, dirt and mud. Elevation changes are created using natural and artificial features, with jumps used to get motorbikes airborne. Starts are en masse with the winner being the rider that crosses the finish line first. Motocross races are classified based on the motorbike displacement, rider age and ability, type of motorbike (that is, quads or with sidecars), the age of the bike. The UK is the British Motocross Championship (www.mxgb.co.uk) is the UK's premier motocross competition. It is divided between MX1 (251cc to 450cc engines) the MX2 (175cc to 250cc engines) classes. In 2013, over 40 riders participated in each of the MX1 and MX2 classes. A youth class and veteran class are also included for certain races. The championship is governed by the Auto-Cycle Union (ACU). Events are held across the UK from March to October. Venues in 2013 included Farleigh Castle, Hawkstone Park, the Milton MX Park, Lyng (Norfolk), Foxhill (Swindon), Desertmartin (Northern Ireland), and Doncaster's FatCat Moto-Parc. Hawkstone International (www.hakwstoneinternationalmx.com) is one of the best attended motocross events in the UK. Held at the historic Hawkstone Park MX Circuit, the pre-season event attracts major race teams and riders from the UK and abroad. The MX1 race brings together nearly 50 world-class riders, while the MX2 line-up generally includes a similar number of competitors. Freestyle motocross features riders performing remarkable tricks as they soar above a track from purpose-built ramps. Competitors manoeuvre motorbikes to create dazzling stunts. Also known as FMX, judges rank jumps and stunts. Two main events include Big Air, where riders perform two jumps from a ramp, and Freestyle Motocross, where riders complete two routines on a course with jumps of varying angles and lengths. Riders typically use the same equipment as their motocross peers, although bikes are modified to lower the weight and improve performance. One of the main freestyle motocross events in the UK is the Red Bull Pro Nationals (www.redbullpronationals.com). Competitions take place from April to September at venues across the UK. In 2013, venues included Landrake Moto-Parc, Weston-super-Mare, Whitby, Culham Park, Canada Heights, and Hawkstone Park. Another major event is Arenacross (www.arenacrossuk.com), which is organised from January to March. Future venues will include the Motorpoint Arena in Sheffield, London's Wembley Arena, the Odyssey Arena in Belfast, Birmingham's LG Arena, Echo Arena in Liverpool, and Newcastle's MetroRadio Arena. Indoor motocross is known as supercross. Races tend to be more technical and rhythm-like and feature more jumps when compared to motocross. Events are generally organised in arenas and stadia. Although more popular outside Europe, one of the main supercross events in the UK is the British Supercross Championship. Sanctioned through the MC Federation, the series is open to professional and youth riders. Another variation of motocross is supermoto. A mix of road racing and motocross, supermoto uses motocross motorcycles with road-racing tyres. Tracks feature road and dirt surfaces in different areas in closed circuits or temporary venues. The ACU-sanctioned British Supermoto Championship (www.norasport.com) brings together top supermoto riders. It includes open and seeded competitions held from March to October. Previous venues have included Three Sisters in Wigan, Rednal Raceway, Finmere Showground, Blyton Park, Rowrah's Lakeland Stadium, and Teeside Autodrome. Also known as observed trials, motorcycle trials are a non-speed sport. It uses extremely lightweight bikes that do not have seating. Motorbikes also have short suspension travel when compared to machines used for motocross and enduro events. Riders attempt to avoid touching the ground with their feet as they travel through an obstacle course. Courses are designed to challenge riders and test their skill, and riders are scored for each section. Each time a rider touches the ground with any part of the body, a penalty is given. The Scottish Six Days Trial (www.ssdt.org) was first organised in 1909. The event attracts competitors from around the world with riders travelling up to 100 miles per day for a total of six days. On-road and off-road sections are used for the event, which tests a rider's skill, consistency and endurance. Since 1977 the competition has been held at Fort William in the Scottish Highlands. The event is limited to 275 riders, although there are often over 500 entries to participate according to the event organisers. Another major trials event is the Scott Trial, which is run over an off-road circuit. The event attracts professional riders and is a fundraiser for local non-profit organisations. First held in 1914 in the Yorkshire Dales, the current 84-mile course through Swaledale has 76 sections. The event is currently organised by the Richmond Motor Club (www.richmondmotorclub.com). Enduro is an off-road motorbike sport that focuses on endurance. Riders compete in circuits with a typical lap of 10 or more miles, generally through forested areas. Laps feature various stages with target times with the goal for each rider to meet the exact time. If a target time is not achieved, a rider is penalised for being too early or late. Certain events are held over several days, while typical events last between three and four hours. Cross-country rally are larger than enduro events, often lasing several days and covering hundreds of miles. Off-road routes take riders along different types of terrain. Larger motorbikes are typically used. The most famous cross-country rally is the two-week Dakar Rally, which takes riders from Europe to Africa via the Sahara Desert. The ACU sanctions the British Enduro Championship, the British Classic Enduro Championship and the British Enduro Sidecar Championship. The premier event, the British Enduro Championship, is typically organised from March to November. In previous events, the championship included a six-round format with 11 races in Wales, Scotland, Yorkshire, East Anglia and the South East of England.